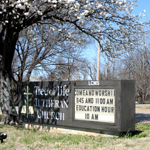 Our invitation to you... Tree of Life Lutheran Church is a dynamic, growing church dedicated to sharing the peace, love and joy of Jesus Christ. It is an exciting and vibrant ministry with many opportunities to get involved. Come meet our Savior, and be fed by His word. The loving family of Tree of life rooted in Gods Word, Exists to share the joy, love and peace of Jesus Christ with you.